The new sailnumber for "Scatoulitsa III" is not yet registered with the OeSV, the Austrian Sailing Federation; it has been entered here for record only. 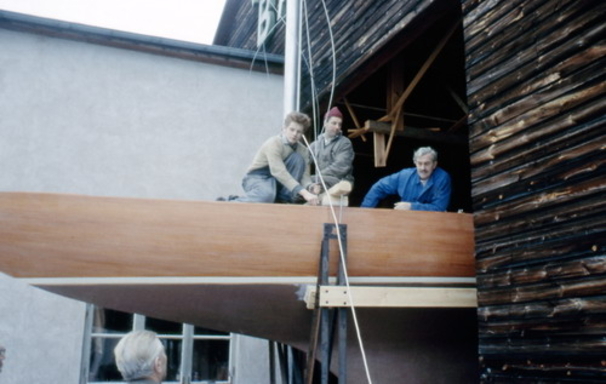 Owners in Austria wishing to apply for a new AUT sailnumber have to get their older measuring certificates stamped by a measurer, who is reconfirming the boat being a 5.5m. For further info on the process, owners can contact the local 5.5m Class Association. Hi, I'm the new owner of SUI-052, bought the boat in 2005 from Mr. Gindroz. My name is Karl-Ernst Dietrich, live in Bregenz, Austria and have the boat located here on the lake of Constance. The boat once got a cabin and a separated rudder, don't know when, maybe in the late seventies or early eighties, because the glue used for the cabin looks like Balcotan, the rudder has a stoneage-shape and the rig isn't original now. Some things will be changed in the coming years, not the cabin, but we will not compete with the current weight of about 2,3 tons.